It is important to first understand that we consider the A-team "ONE TEAM” that happens to play JV & varsity games. In other words, we practice as one team and we do not differentiate players based on their grade. Everyone runs the same drills, learns the same plays, etc. Come game time, our goal is to put players in positions to "succeed" regardless of what grade they're in. That said, there may be some instances where a 7th grader may be asked to play in varsity games and where an 8th grader may be asked to play in JV games. There have also been times where some players have been asked to play in both. Neither decision necessarily has to be for the entire season. If a player exhibits the ability to play varsity at a later time, he will be given the opportunity to do so. As for game day coaching philosophies, our JV and varsity games are coached a little differently. Varsity games are coached in a competitive manner. There is a league championship and we feel that your kids deserve to compete for that championship. On the other-hand, our JV games are coached with a focus on player development, instruction and playing time. History has shown that players whose parents supported this concept had positive experiences and enjoyed the "success" that they encountered on the football field. There are several examples of 8th grade players who have played JV at the A-level and have gone on to have successful high school careers. I like to believe that because they were put in situations to "succeed" (rather than fail) helped to facilitate a desire within them to continue to work toward getting better at a game that they grew to love. 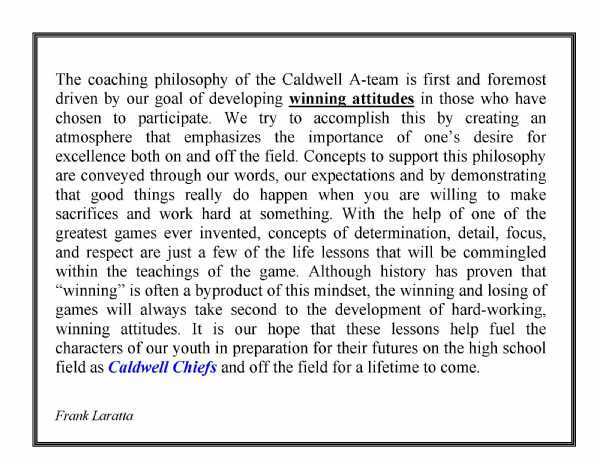 For the benefit of your son's football experience, please join our staff in supporting this philosophy.